Moved out to Sherman Oaks in March so it’s about time I share a quick post to share how the room came out, cause I’m super stoked on how it all looks. Bought this rug off a friend when she moved and I (proudly) figured out how to maneuver all the furniture and get it into the room all by myself. I think my body still hurts from this process, but it was way worth it. The turquoise dresser was bought on Craigslist off a woman who fixes up old pieces as a hobby. The bed is IKEA (as is the mattress). The pillows are a combination of Pottery Barn and Anthropologie. All-white bedding was purchased by my generous Mama from TJMaxx and I’ve learned that white gets super dirty super fast. 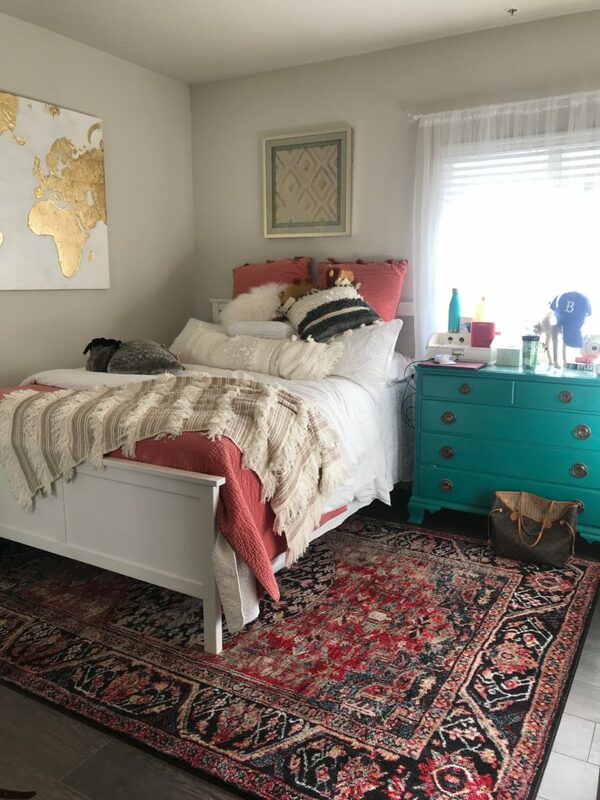 The gold piece above my bed is from Home Goods (new obsession) and the large gilded map print was purchased on a whim from Cost Plus cause it was too pretty to walk away from.